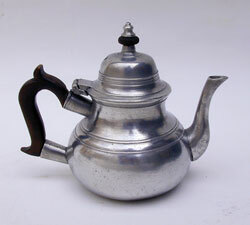 An attractive 18th century English Export Pewter Pear Form Teapot circa 1740-70 marked with a crowned X on the outside bottom. It is most certainly a product of London and where someone to find the “X” mark in association with a known maker it would clearly identify that pewterer as the maker of this piece. If you have questions about any of the items on the site, please email us at philt@snet.net or call (860) 267-2146. (Please call between 9:00 AM and 8:00 PM EST only). All items are guaranteed for authenticity and condition. Click Here to read more about our Policies and Terms of Sale.